Can't attend? Follow Getai Group Singapore to know of future events! (Children 7 & below and adults 65 & above will enjoy free admission). This is a non-smoking festival. 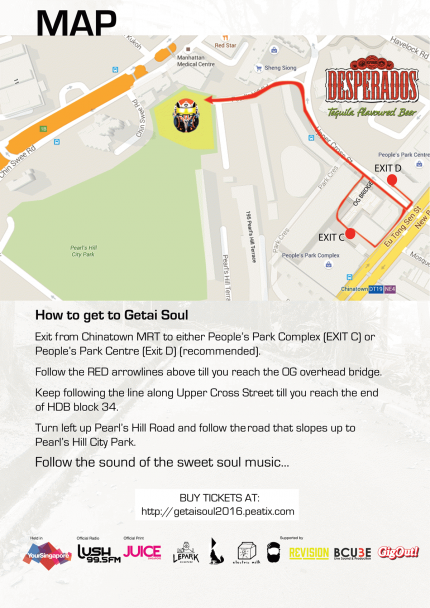 From Chinatown MRT Exit D, cross towards OG and walk along Upper Cross Street till Block 34 where Pearl's Hill Road is. Walk up Pearl's Hill Road till you see the entrance to Pearl's Hill City Park. You will see the festival grounds there. Soul music is a mainstay in popular culture but not as popular in Singapore as it is from Japan to the Malaysian Peninsular to the Indonesian Islands. There is a lot of magic in the groove and melody of soul music that allows for expression that is unrivaled in terms of vibe and feel. 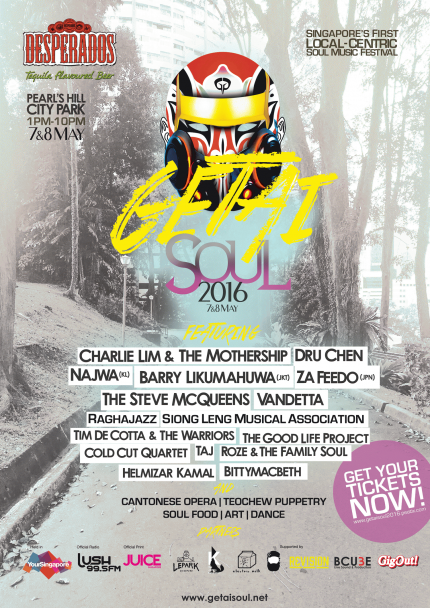 Inspired by African-rhythms, jazz, soul and funk, Getai Soul will bring the best soul musicians in Singapore and the region together for a weekend of Soul music, food & fun. With original acts from the Island city’s finest soul musicians, including frontier-breaking bands from Kuala Lumpur, Tokyo and Jakarta, the lion city will be in for a unique treat of soul music in its modern form within the shape of original regional content. 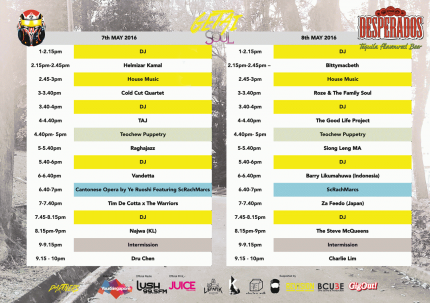 Unlike anything before, Getai Soul will be the stage for music-lovers to discover and embrace not just soul music, but great quality original content from our city and this part of the world. But on top of this, the soul of a people’s identity is yet another level of celebration that we aim to hold with this festival. We want to celebrate where we come from, who we are and embrace the fact that despite a lot of our art and music influence following the lead of Western and other foreign culture, that we ourselves have a lot to share and express uniquely as Singaporeans and have increasingly been more aware and adamant about this.